Our Optic line combines a fluted clear bowl with a multi-color pattern running up the stem. We have always melted lead free glass at our shop. 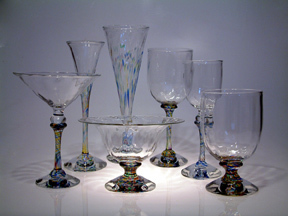 All our stemware is handblown, puntied and hand finished which we strongly feel leaves a softer edged, more pleasant rim with better mouth feel and is more chip resistance for those occasional bumps along the way. It takes more time and skill than a "scored and cracked" rim, but we feel the effort is worth it as well as the enhanced experience of a better delivery system�Ķwhich is passed on to you!